Lipa Noi are located at the west coast of Samui. Koh Small, uninhabited beaches with crystal clear waters, perfect for relaxing beach holidays and snorkeling. From here you have the best sunset views. Its closeness to the island’s main car ferry pier makes Lipa Noi a convenient choice for anyone driving to Koh Samui from the mainland. The beach has fine white sand and there are no rocks or coral in the water, making it one of the best beaches for kids on the island. The water is also very shallow for up to 100 metres out. The remoteness of the beach is what makes it most attractive to the visitors, who return here, year after year, in quite large numbers. The demographic of tourists here is older than you’ll find elsewhere on the island, and mainly comprised of pensioners and families. Be prepared to be independent, and either rent a car or strike a deal with a taxi driver. Shopping is limited in the area, and so you’ll need to go to port town Nathon, 5km away, on a regular basis. At the sandy beach of Lipa Noi beach you will find only a few resorts, all owned by people, determined to keep this last undiscovered beach as natural, but also as convenient as possible to their guests, who are used to a high standard of accommodations, but don’t want to miss out on island charm. There are a few well-spaced bungalow operations, of which Big John Seafood ( change to The Lipa Lovely Resort ) is the most popular. Their attached restaurant is also well worth a visit. Lipa Noi is also home to the Samui Dhama Healing Centre one of Samui’s more intense fasting spas. 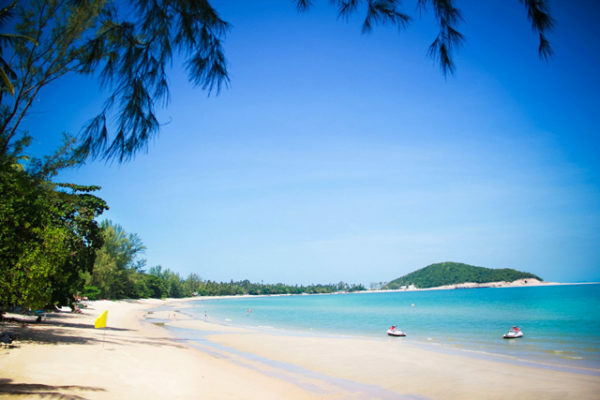 You can walk along the beach and choose from a number of local Thai restaurants providing evening entertainment such as Thai dancing and acrobatics. You can also enjoy a massage right on the beach under one of the many sheltered salas. The depth of the water here allows for year- round swimming and a good choice of water sports. Close to Lipa Noi you are in close proximity to Paradise Park Farm, a children’s heaven in the hills above Lipa Noi displaying many different species of animals and birds. The entrance ticket covers free use of the pool and its facilities. There is a restaurant offering a full Thai menu. Lipa Noi is mostly a residential area with only a few hotels and boutique resorts and spa, which ensure there are only so many people wandering on the beach and provides even more privacy for guests in the private villas in that area. Lipa Noi offers a more serene ambiance with outstanding sunsets over the Marine Park. Tongyang beach boasts soft, white sand flanked by endless lines of coconut plantations and is a great place for sunsets. Far from the noise and bustle, the surrounding atmosphere is peaceful and attractive.